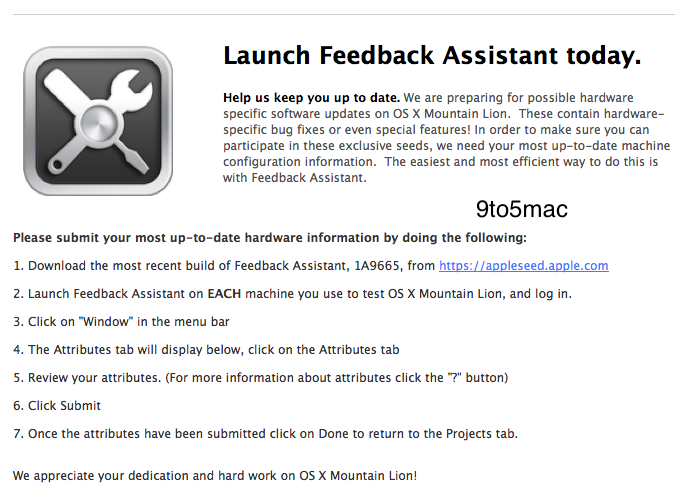 We are preparing for possible hardware specific software updates on OS X Mountain Lion. These contain hardware-specific bug fixes or even special features! In order to make sure you can participate in these exclusive seeds, we need your most up-to-date machine configuration information. The easiest and most efficient way to do this is with Feedback Assistant. The first type of special feature that comes to mind is the upcoming Mac Retina Display. According to our sources, Apple will rollout this display first in the new, thinner, faster MacBook Pro line at WWDC in mid-June. Apple says that Mountain Lion is launching in late summer, which probably means the new MacBook Pros will ship with OS X Lion. This also likely means that Apple will continue to seed pre-release versions of Mountain Lion after the new MacBook Pros launch. Since Retina Display technology is a combination of both hardware and software, it is possible that Apple is referring to pre-release Mountain Lion versions that support the next-generation MacBook Pro Retina Display.